Vegan spice cookies with a coffee glaze, take them to your next cookie exchange or keep them all for yourself! Recipe from The Vanilla Bean Baking Book. It’s been almost a couple weeks now since I’ve had a fresh recipe, ah! Between going on vacation last week to Punta Cana (yes, it was amazing and no I didn’t want to come back to the snow) and starting to battle a cold, I took a little bit of a break from recipe testing and posting. But, I am back with a vegan spice cookie recipe that you are going to need to add to your Christmas rotation this year, trust me. This spice cookie recipe comes from a cookbook that I’ve been anticipating for months, waiting for it to be delivered to my doorstep so I can thumb through it quickly, then slowly pick out each and every one of the recipes that I want to make. Dear Sarah from The Vanilla Bean Blog wrote this gorgeous baking book and I already know it’s going to become one of my favorite baking bibles for years to come. I first met Sarah when Sara and I met in Minneapolis and had the most amazing arepas for dinner, along with a bunch of other area bloggers. It has to go down as one of the best meals I’ve had, between the yucca fries (amazing), sweet cocktails (boozy!) and lovely company we had to share it with. During dinner, I ended up sitting next to Sarah, chatting about her cookbook process and baking in general. I don’t know if I’m just weird or it’s a real thing, but I’ve always thought there’s a connection when people who love to bake meet that is just different than the relationship with someone who doesn’t prefer baking. Baking takes a special patience and devotion that not everyone loves, but I’ve always found that it’s the best parts of the baking process that I adore. Those who share a love for baking too just seem like my spirit animal (probably why some of my best friends are also bakers like me) and it feels like we could chat for hours about all things dough, yeast, best cookie recipes, etc. 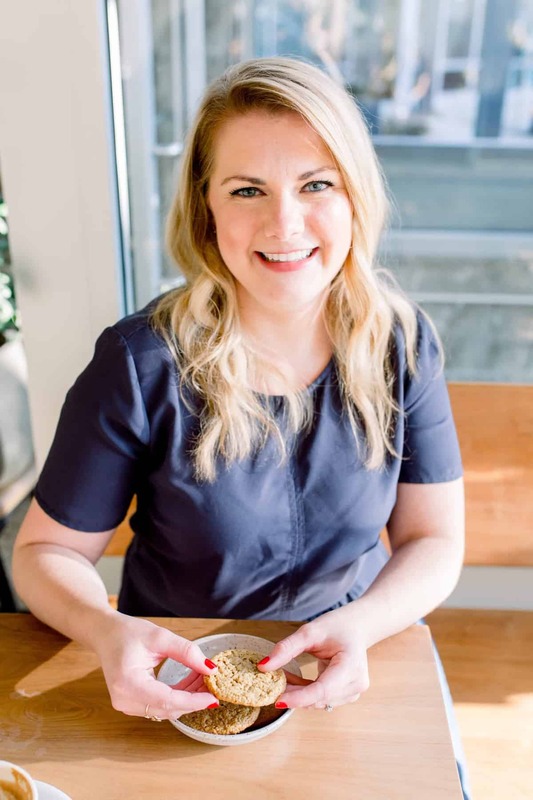 Sarah is no different, with her devotion to finding the best baking recipes she possibly can and recipes that aren’t daunting to the inexperienced cook. From cakes (she has a killer vegan chocolate cake recipe in there) to cookies to breads that I can’t wait to make for our breakfast table, The Vanilla Bean Baking Book has quickly become the one that is being pulled from my collection again and again. I chose to make Sarah’s Spice Cookies with Coffee Glaze, because they seemed like the perfect Christmas cookie. I normally veer to a sugar cookie or gingerbread, but I loved that these spice cookies combined the best of both worlds, with a tender sugar cookie-like dough and plenty of spices to round out the Christmas flavors. I also found myself licking the leftover coffee glaze out off of the whisk (don’t judge) because it is just THAT good. Who knew that putting cold brew in a glaze was basically one of the best ideas ever? Sarah sure did. Long story short, you should get Sarah’s book and treasure it, it’s a gem and will become your go-to baking bible, just like it has been for me. Big congrats on the lovely book Sarah! Don’t skip the water in the dough recipe! I found that the dough was crumbly if I didn’t add the water, so I would not skip it. If you are impatient, still don’t skip the dough chilling part! It yields a much better dough and helps bring the dough together. The cookies are great on their own, but the glaze makes them even better. I used cold brew in the glaze because it gave more of a coffee flavor, but you can use regular brewed coffee too. In a small bowl, combine the cornstarch and 2 tablespoons water, set aside. In a medium bowl, whisk together the flour, baking soda, salt, cinnamon, ginger, cardamon, and pepper. In the bowl of a stand mixer fitted with a paddle, beat the coconut oil, olive oil, and water on medium until smooth. Add the granulated and brown sugars and beat on medium until light and fluffy, 2 to 3 minutes. Add the cornstarch mixture and vanilla and mix on medium until combined. Add the flour mixture and mix on low until just combined. Gather the dough, flatten into a disc, and wrap with plastic wrap. Chill for at least 2 hours and up to 1 day. Lightly flour a work surface and roll the dough to 1/4 inch thick. Using a 2-inch biscuit or cookie cutter, cut out circles. Gently slide a metal spatula underneath each round and transfer it to a prepared baking sheet. Place 12 on each sheet. Put the first baking sheet in the freezer for 10 minutes. After the dough has chilled, put the first pan of cookies in the oven, and then put the second pan in the freezer. Repeat with the leftover dough. Bake one sheet at a time 10 to 12 minutes, until the cookies are just beginning to brown on the edges. Transfer the baking sheet to a wire rack and let the cookies cool completely on the pan. For the glaze: In a small bowl, whisk the confectioner’s sugar, coffee, and vanilla. Whisk in the almond milk 1 tablespoon at a time. Add just enough almond milk to make a thin glaze. Using an offset spatula or kitchen knife, spread a thin layer of the glaze on each cooled cookie. Let the glaze set a few minutes before serving. Really kind of obsessed with that coffee glaze. The glossiness in these photos makes me want to dive through the screen and grab one! It was so fun when we all got together for dinner at Hola Arepa. I’ll remember that forever! And Sarah’s book has been such a joy to read. I’m working on gf-if-ifying a few of the recipes and hope to share too. xo! Awww yeah, that glaze looks spoon-licking good! I need to get my hands on Sarah’s book ASAP. I’ve seen so many gorgeous and delicious recipes coming from it. Wish we were sharing cookies and wine together right now! Miss you, babe! There is nothing like a beautiful shiny cookie glaze! These cookies are GORGEOUS. Love the photos and love the flavors. I need to get my hand on a copy of Sarah’s book. I’m making these tomorrow. They look great! Book looks beautiful, too – are all the recipes vegan? Hoping they are as I’ll be purchasing it stat! Hi Trish, Sarah has a few vegan recipes, but it is not a book of vegan recipes. I would recommend it regardless, as it has lots of great baking knowledge and many recipes can be vegan-ized! yay! i’m a big fan of sarah’s blog and book; these cookies were one of the first recipes i bookmarked. they sound and look so yum! I basically want everything in her book! You had me at sugar and spice. That is a combo I can totally get behind! And that glaze! So pretty. So it can be eaten for breakfast, right? Dude, the minute I read coffee glaze – I was hooked. These look dynamite! Um RIGHT?! So dang good. Sarah’s book is exquisite, EXQUISITE! You made these cookies look absolutely incredible Abby. You already know how I feel about that one photograph sister. You say to add the granulated and brown sugars but there isn’t any granulated sugar in the ingredient list. I’m going to have to guess today, but please fix this! I’m so sorry, the recipe has been fixed! Could these be made as cut-out cookies, or would anything in the recipe need changed? I’m not an experienced baker! Yes, they could be made at cut out cookies! I followed the recipe but my dough turned out more like thick applesauce consistency and I’m not really sure what went wrong. Oh no! So sorry it didn’t work out! Hi there! A hand mixer should work just fine! I would let the dough thaw for a bit or let it chill for less time. Hope this helps!